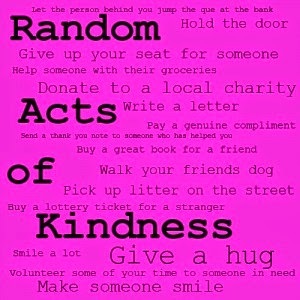 mammasplace: Today is Random Acts of Kindness Day! Do you participate in this? Today is Random Acts of Kindness Day! Do you participate in this? Today is Random Acts of Kindness Day. And, you know what to do...perform a few random acts of kindness. Almost any kind deed will do. And, we highly recommend you perform kind acts on as many people as you can. This is a favourite day of many people and groups. People like the idea of showing a little kindness to others. Its a fun and good thing to do. And, they like being on the receiving end of this day as well. It makes both the giver and the receiver feel good. Schools have used this day as an educational event, and to promote the value of kindness. Organizations have used this day to promote their cause, and for fundraisers. What are your thoughts about having a random acts of kindness day? I think this is great to encourage others to be kind and go out of their way to do good things for others. Personally I try to do this on a regular basis in my life as I enjoy making people happy. There is joy in helping and giving to others. If you participate in random acts of kindness, what have you done personally? There are many things a person can do to be kind others it doesn't always cost money either, it can be giving your time to help others. Do something today to bring joy to someone! Sometimes in life you have to be a Blessing to receive a blessing, call it Karma, sowing and reaping or paying it forward. Today is Don't Cry Over Spilled Milk Day? National Make a Friend Day!